We continue to know the Lord’s blessing, and a good number of visitors have passed through the Exhibition during the Summer months. Besides the regular openings, in August we were pleased to welcome the visit of a group from the City Church, Birmingham. That same month was the occasion of our Summer Cream Tea and Summer Second-hand book sale which was extremely well attended. In September we held our annual Local Exhibition, when we opened every day and were favoured within the region of 200 visitors. 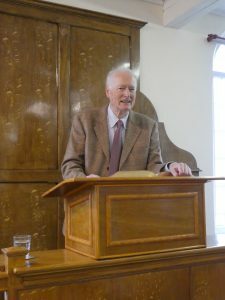 October is the month of our Autumn Lectures, and once again we were privileged to welcome Dr Geoff Thomas, who gave two excellent lectures on Welsh Preachers, focusing on the m inistry of Dr Martyn Lloyd-Jones. We look forward in November to hosting our first High School visit of the Autumn Term. We are more than grateful to the faithful band of helpers and supporters who enable us to continue in this ministry. Gratitude is also expressed to friends up and down the country who have donated items for the displays, and others who have given second-hand books which are sold in our Summer and End of year sales to raise funds for the work. The Winter book sale is scheduled to be held on Saturday 1st December between 2pm and 5pm. We are very much aware of the fact that God’s hand has been upon this work, and look to him to sustain and further develop activities at the Centre.